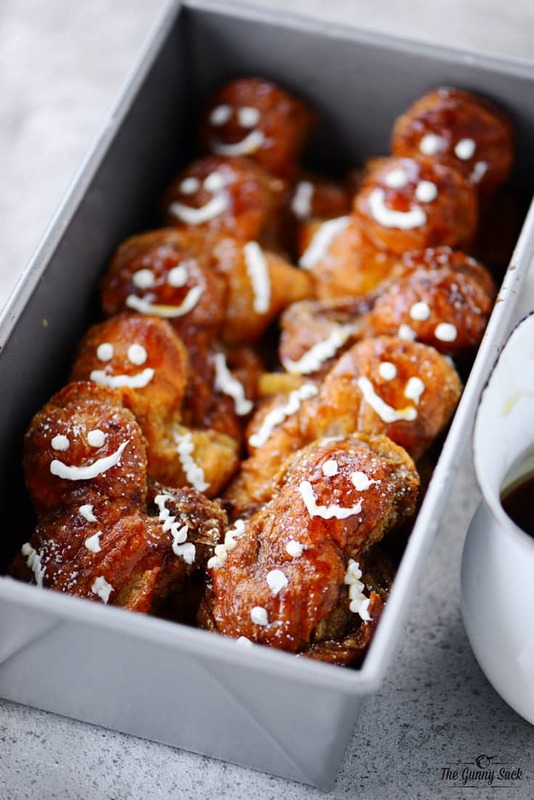 This Eggnog French Toast Bake is the perfect breakfast for overnight guests, holiday brunch, or Christmas morning! 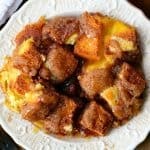 Its an easy French Toast Casserole recipe can even be prepared the night before and is a great way to feed the whole family in one fell swoop. 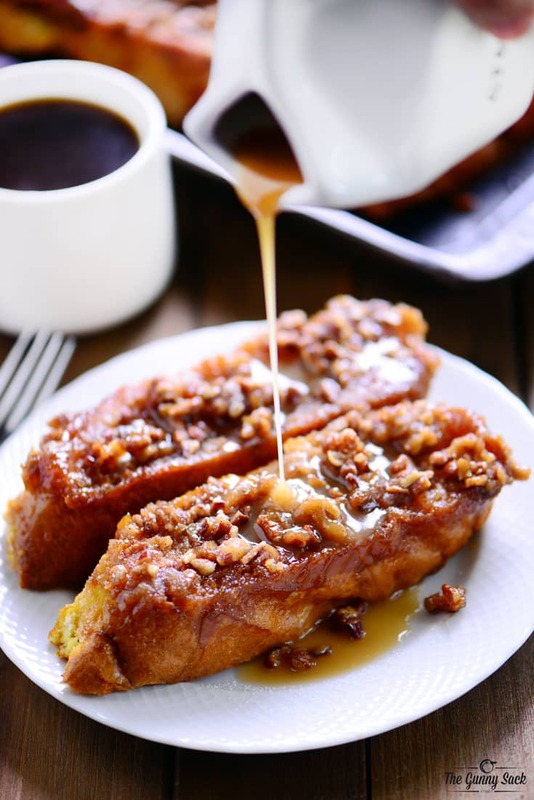 It’s wonderful to wake up to a delicious family breakfast but no one actually wants to do the cooking first thing in the morning so a recipe like this Eggnog French Toast Bake is the way to go. Plus, if you aren’t a morning person, you can get it ready the night before, store it in the fridge, and pop it in the oven in the morning! 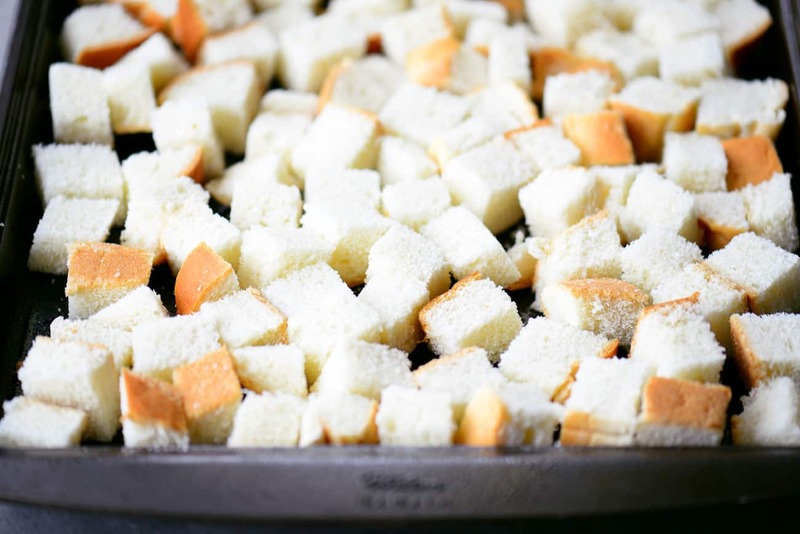 Start by cutting the bread into cubes, ending up with about 10 cups of bread cubes. I typically use Italian bread or French bread but sourdough, croissants, brioche or even cinnamon rolls would work too. 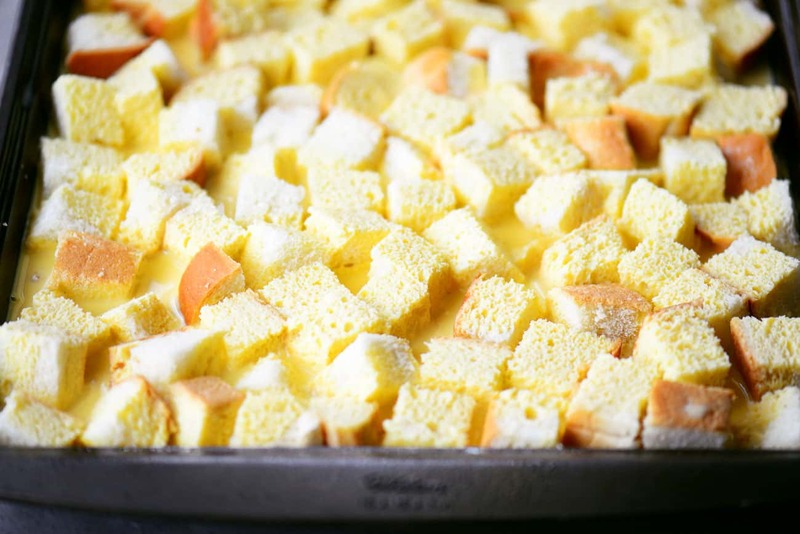 Spread the cubed bread out in a greased jelly roll pan and set aside. Put eggs, eggnog, and salt in a bowl and beat well. Pour the egg mixture over the bread cubes and set aside. If preparing the night before, stop here. Cover with plastic wrap and place in the fridge overnight. In the morning, heat oven to 350° F, remove the plastic wrap and continue to the next step. Mix together granulated sugar, brown sugar, ground cinnamon, ground nutmeg, ground cloves, melted butter, and vanilla extract. Drizzle the mixture over the bread cubes. Bake at 350° F for 1 hour until cooked through and golden brown. Or if you prefer a bread pudding texture, only bake for 45 minutes. 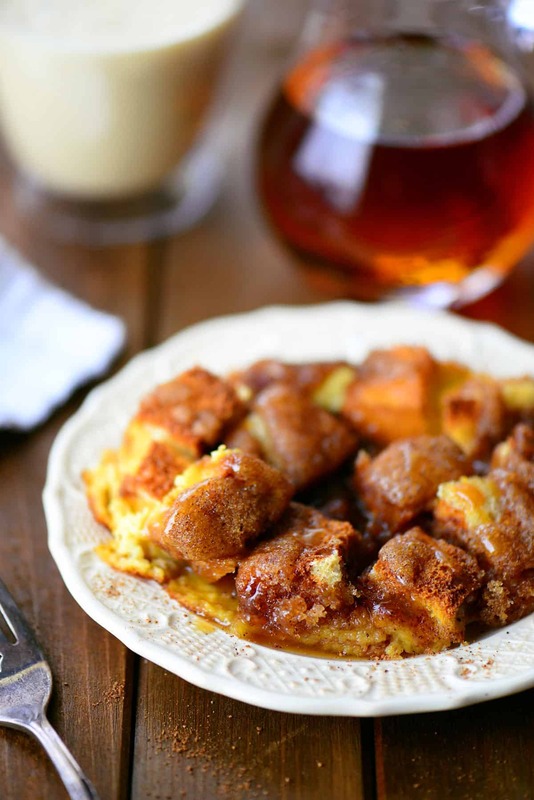 Serve immediately with warm maple syrup. This Eggnog French Toast Bake is the perfect breakfast for overnight guests, holiday brunch, or Christmas morning! 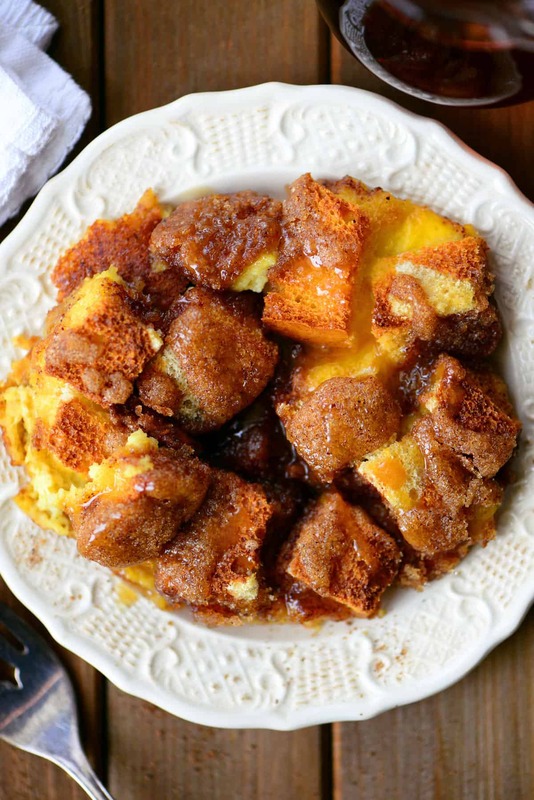 This Eggnog French Toast Bake is the perfect breakfast for overnight guests, holiday brunch, or Christmas morning! Heat oven to 350° F, if baking immediately. 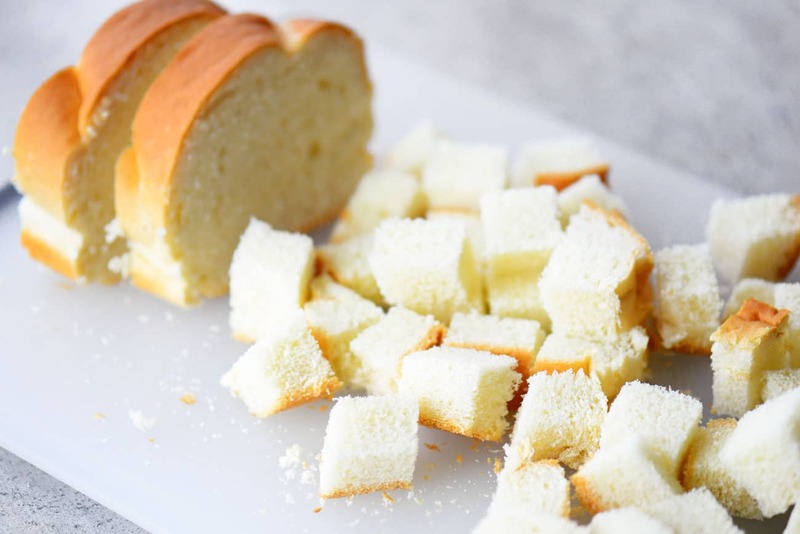 Start by cutting the bread into cubes, ending up with about 10 cups of bread cubes. 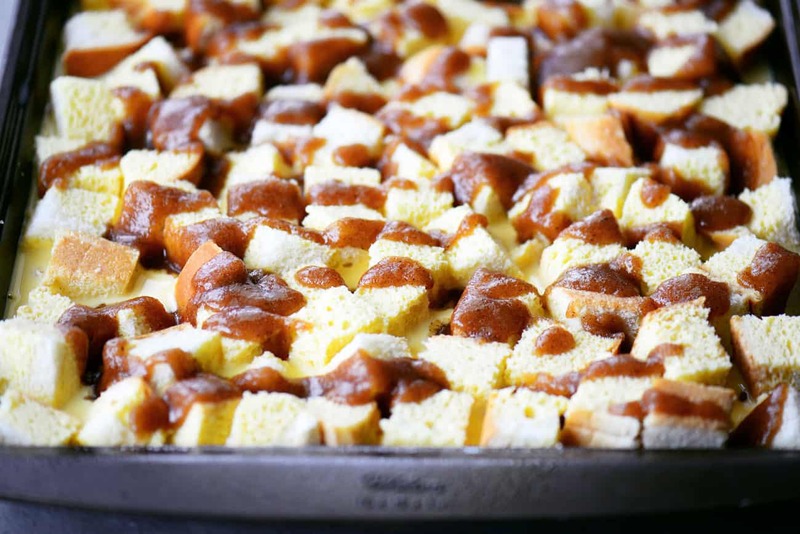 Spread the cubed bread out in a greased jelly roll pan and set aside. 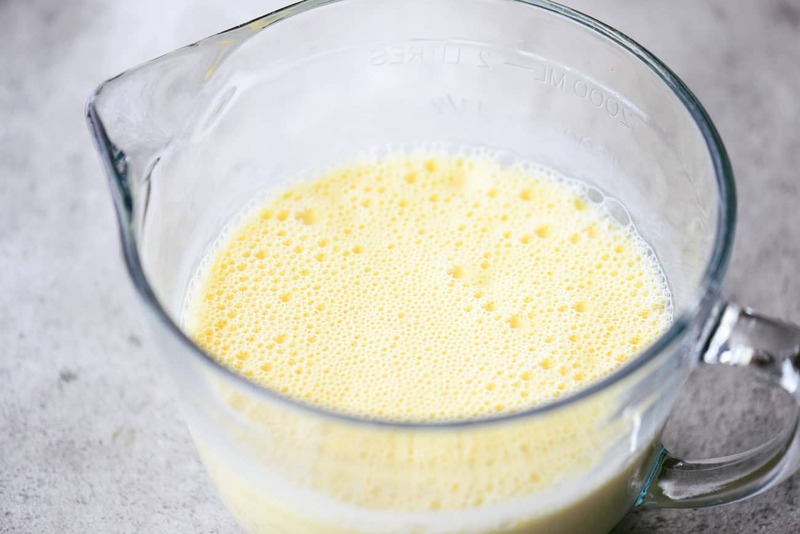 Put eggs, eggnog, and salt in a bowl and beat well. Pour the egg mixture over the bread cubes and set aside. 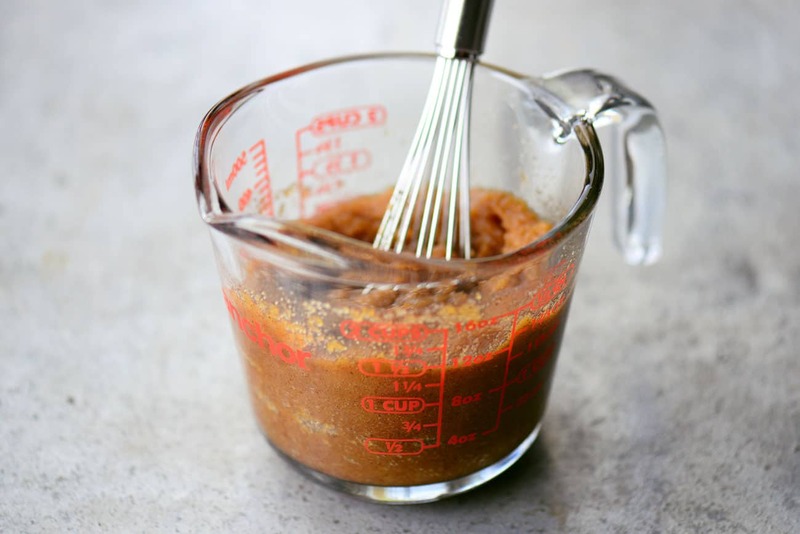 Mix together granulated sugar, brown sugar, ground cinnamon, ground nutmeg, ground cloves, melted butter, and vanilla extract. Drizzle the mixture over the bread cubes. Bake at 350° F for 1 hour until cooked through and golden brown. 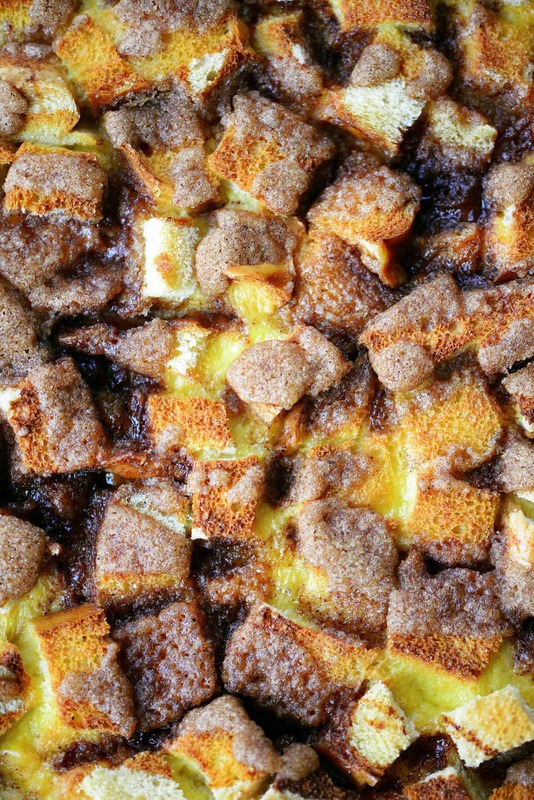 Or if you prefer a bread pudding texture, bake for only 45 minutes.